Fighting game championship EVO 2013 may close with a duel of ponies. The organisers decided that this year’s closing tournament would be decided by a donation drive where whichever community donates the most money to Breast Cancer Research Foundation can have their game played by the professionals to end the event. Among the list of classic fighting games like Super Smash Brothers and Virtua Fighter is an unexpected entrant: MLP: Fighting is Magic. A fighting game based on the My Little Ponies franchise. MLP: Fighting is Magic takes thecharactersfrom the My Little Ponies television series, Friendship is Magic, and throws them into the ring to hoof it out. Despite not being complete, there is a good chance that we’ll see Fighting is Magic win this donation drive. Previously, the My Little Pony fans (bronies) have shownsignificantfinancial clout. They usually lead the Humble Bundle donations, banding together to make a single donation, large enough to take the top spot on the donations list (often a single dollar more than Notch). 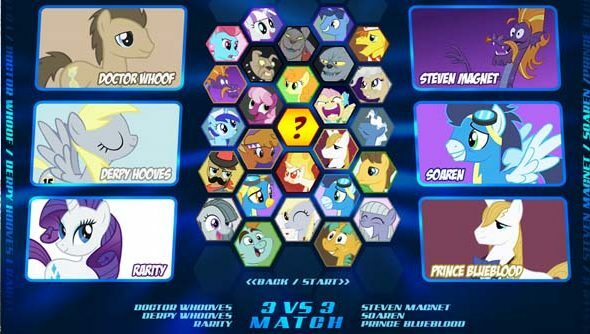 The chance to see My Little Ponies lead the largest fighting gametournament in the world may be enough of a draw to get the community to back it. Fighting is Magic currently doesn’t have a release date, nor plans for an open beta. While there is a version floating about the web somewhere it’s an outdated test build which the dev’s say in their on-site FAQ“doesn’t accurately reflect the final product by a long stretch”. You can see the other games up for nomination here.